The dreaded period had arrived. And with it, the diarrhea and bloating, of course. I was getting dressed for work - a position in which I'm the third person in line to run a hospital. My internal monologue is firing: You do hear me saying that, right? The third in line to run this hospital. Bossy, you are the third person in charge, the only woman after two men. And the youngest. Last week, I worried about my sweater matching my shoes. This week, I run a hospital or I am the "third person in line" to run the hospital. My boss reiterates this to me often, which, I suppose, makes me pretty important. And so, I get up and get dressed, contending with my womanly issues, so I can go play in a man's world. Does this being a "boss lady" affect me and my relationships with men? Of course it does. Every past relationship I've had with men has always been a struggle from the beginning. I was a fourteen year old girl, sitting in my mother's red van and watching her sob because her second husband had cheated on her after three months of marriage. She couldn't leave him. Why? Well, because she couldn't afford to leave him. That day changed me forever. I had previously watched my father beat the hell out of my mother, and now this man sleeps with anything that remotely has a pulse - and she couldn't leave?! In some respects, I was this little furious girl who just could not believe it. I was floored. How could she keep putting herself in a position to be abused and not leave? But then I grew up, and, of course, repeated some of those very same life decisions and began to understand. Although, I will say, I learned. I had my fair share of abusive relationships, but I got out and vowed to never be that woman again. Looking back on these relationships and how my mother and I arrived in some of those situations, I often ponder, why do we as women agree to be submissive? To go with the flow? To be agreeable? To not be "bossy?" And, more importantly, to not strive to be the "boss lady" so we don't end up in those impossible situations? My father and I had a conversation this week, wherein all he could sarcastically say was "how proud of me he was." All the while, I knew he was not being genuine; he's not proud of a daughter that he cannot control. He knows he's talking to a badass woman, and that scares him. He's talking to a woman who commands respect and doesn't have to scare people so that she is only loved out of fear. He's talking to a woman who knows she can be whoever she wants to be and will be happy and content with that. He's talking to a woman who rocks it in a man's world every day and who is still a woman and a boss - all at the same time. Not only am I the provider he could never be, but I'm also the nurturer he could never be. Me being a "boss lady" might frighten him, but it doesn't frighten me. How has being a bread-winning-boss-lady affected my relationships? I say this: Only the strong have survived. Only the toughest men - ones who are not intimidated by a woman of strength, but, rather, are uplifted and motivated by it - can hack it. My husband utilizes my strength to our mutual benefit; he's not intimidated by it. He uses it to motivate himself and to help make us a successful winning team. We do great things together; we compliment each other well. So I say to all the ladies: Do not be scared to be strong. Do not be scared to be sassy. 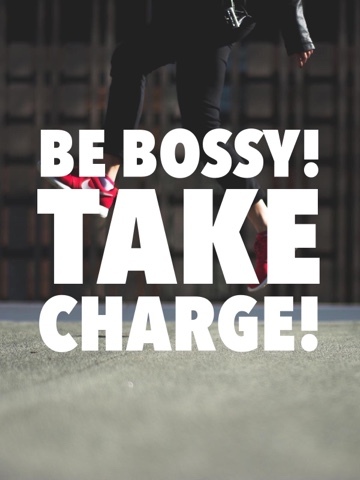 Most importantly, never be scared to be BOSSY! You're amazing. You'll be running it sooner than later.